Ground Penetrating Radar Systems was recently called by a local contractor to a renovation project at the water treatment facility in Columbus, Ohio. The contractor needed to core drill through the slab to install new electrical services. 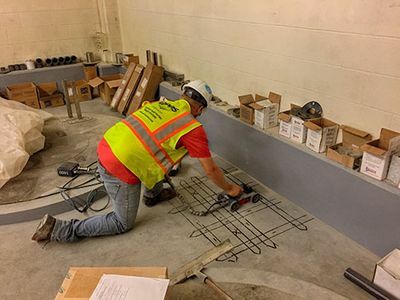 GPRS marked out all reinforcing steel and conduits within the slab so that the contractor could avoid damaging conduits, and jeopardizing the integrity of the slab. GPRS, LLC. was able to get to the job in a timely matter so the project could remain on schedule. GPR is an accurate and effective way of locating conduits, rebar, and post tension cables in a concrete slab.